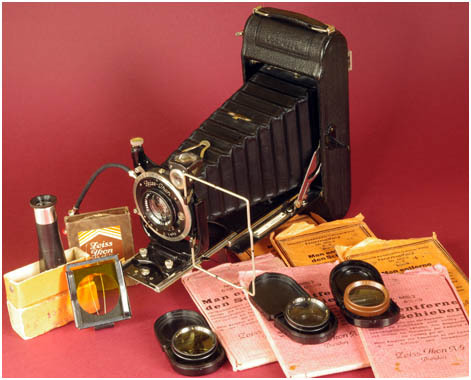 The Zeiss Ikon Icarette, as the name suggests, was inherited from Ica when Zeiss absorbed that company in 1926. 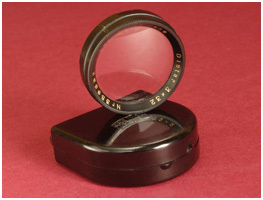 Although the Ica produced forerunner started out life in 1919 it was continually developed and Zeiss must have considered the design had merit as they continued with it until 1936. During this time numerous formats, body types, shutter and lens combinations arose. The camera was certainly a notch above many of it's contemporaries, particularly the higher grade models - such as our example. 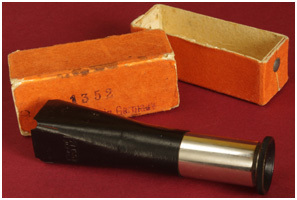 This example can be used with roll film or plates as it is fitted with a plate back for critical focus photography. The standard of construction and finish is high, operation is delightfully smooth and precise but without a feeling of delicacy. The name appears to be "Jcarette", owing to the highly stylized "I", this is also carried over onto the shutter nameplate, as can be seen in the image. Amongst the camera's interesting features are two clips that prevent bellows sag impinging on the image area, these unclip when the lensboard is racked out, and automatically clip themselves back on when the camera is closed up. The bellows would sag as they are made long to accomodate "double extension" for close up photography. This particular example was donated in February 2010. It was in fine condition and, apart from a deep clean and service, has been conserved exactly as it arrived. Remedial work was limited to polishing the shutter and aperture leaves, as well as returning the seized delayed release mechanism to working order. Dated to 1931, courtesy of it's Zeiss Tessar serial, the Compur shutter serial seems surprisingly low however. The indications are that at least one of its former owners was heavily into macro photography, as the critical focus plate back has been bought, as have several close up attachments, and a focus inspector - all Zeiss Ikon accessories too. This Zeiss Icarette was generously donated in 2010 and came with many genuine Zeiss Ikon accessories, most of which are shown here. The paper envelopes contain plate carriers which slide into the Icarette's plate back. The hinged rear giving access to the film chambers has a hatch and rails which allow plate carriers to be used. You can't use plates whilst there is a roll film fitted though. The plate back gives the photographer the opportunity to focus the image precisely on the ground glass screen before making the image. If you want to see the back, please click the 360 view button above. There is an adjustment fitted to the focus rack so that the focus scale reads correctly should the photographer wish to use plates instead of roll film. As well as these accessories, the camera also came with a carrying case and black silk hood to shade the screen whilst composing the image. The Zeiss Icarette is shown here with the focus rack out to the full double extension, in which position an image roughly 80% actual size is projected onto the plate. This is a Zeiss Ikon Proxar, supplementary close up lens, 2 Dioptre serial 356899. Supplied in a neat little "Bakelite" case. 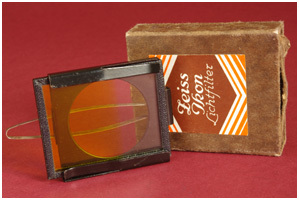 These "supplementary" type lenses slip over the front of the camera's normal lens allowing it to focus much closer than usual. When this lens is combined with the Icarettes's double extension it can project an image greater than 1:1 on the plate. Supplementary close up lenses are fairly commonly found accessories. Another commonly found accessory for a lot of cameras is the Yellow filter. Traditionally used to increase the contrast between cloud and sky in black and white photography. It's disadvantage is that the effect is over the full image, not just the sky. This is a Zeiss Ikon Distar, supplementary long focus lens No.3, serial 359632. Supplied in a neat little "Bakelite" case. Less commonly found are these long focus supplementary lenses which increase the focal length of the camera lens, effectively magnifying the image. The disadvantage is that the focus scale on the lens bed becomes meaningless, another reason for the ground glass screen and glass plate back fitted to this Icarette. 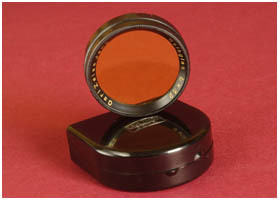 This Zeiss Ikon graduated yellow filter grips the surround of the camera's front lens, and can slide inside it's mount, allowing the yellow filter to be moved to limit the effect to the sky only. Whilst a guess of position is possible, it's best used with the plate back, as the filter can be positioned exactly using the ground glass screen. 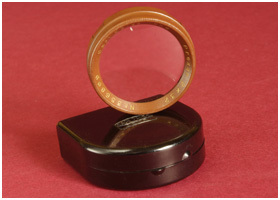 This Zeiss Ikon critical focus magnifier is used to inspect the image on the ground glass screen when using the plate back. The 6 x 9 cm negative size is quite small so this accessory is essential to get the best out of the camera, particlarly for close up photography as the depth of field is shallow. To faciliate the use of this magnifier the small hood that shades the focus screen is detachable, another perfectly thought out and beautifully engineered feature of this 1931 Zeiss Ikon Icarette.